Republican presidential candidate made an anti-tax speech in the state that launched him toward the Republican presidential nomination and in the home state of the plumber he hopes will help him reach the White House. During rallies in New Hampshire and Ohio, the Arizona senator revealed Democrat Barack Obama favors taxes that will hurt the middle class and small businesses despite Barack Obama promised to cut them for 95 percent of taxpayers. 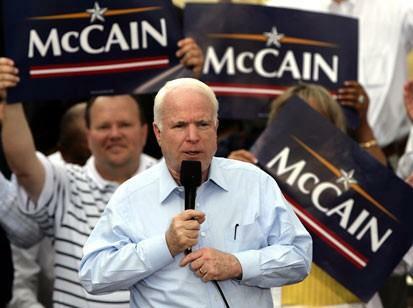 John McCain declared in a football stadium near Akron, Ohio: “Sarah Palin and I will not raise your taxes, my friends. We want you to get wealthy.” The scene had a festive air, with those sitting in the grandstands behind the candidate dressed in T-shirts that composed the red, white and blue Ohio state flag. John McCain and Sarah Palin have accused Obama of fostering socialistic tax policies since Ohio plumber Joe Wurzelbacher questioned the Democrat two weeks ago. Both now routinely invoke “Joe the Plumber” as part of their closing argument. Ohio voted for George W. Bush in 2000 and 2004, but Obama held a narrow lead in recent polls. The state offers 20 electoral votes. Earlier in New Hampshire, McCain implored voters “to come out one more time” for him, as the two-time primary winner tried to stave off a general election loss with sharp criticism of Obama’s tax and spending plans. Although McCain won the 2000 and 2008 New Hampshire primaries, recent polls have shown Obama with a lead no smaller than 7 percentage points with less than two weeks until Election Day. That has prompted speculation McCain may have to surrender the state’s four electoral votes and focus elsewhere if he hopes to cobble together the 270 needed to become president. In a state with no income tax and a Yankee aversion to government spending, McCain tried to rally his supporters with a touched-up stump speech that focused on both issues. He, too, hit the wealth-distribution theme. “Apparently, as my opponent sees it, there’s a strict limit to your earnings as well, and it’s for the politicians to decide. The proper amount of wealth is not what you can earn, but what government will let you keep,” McCain said. In one final jab at Obama, McCain accused him of planning “another stadium spectacle” by planning an outdoor rally in Chicago on Election Night. “Acting like the election is over won’t let him take away your chance to have the final say in this election,” he said. New Hampshire political trends are working against McCain. It was the only state to vote for Democrat John Kerry in 2004 after going for Republican Bush in 2000. Democrats also swept both congressional seats, the governor’s office and both houses of the state Legislature in 2006.